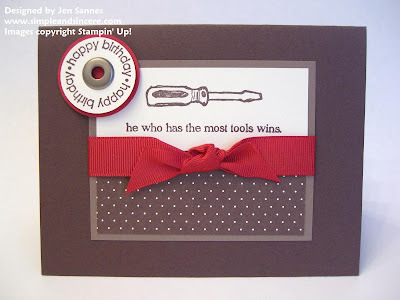 A quick and fun masculine card - perfect for a birthday or even Father's Day. We made this card at Saturday's 10 Cards for $10. I case'd this from a card I saw on Splitcoast, which you can view here. This is such a fun set, called Totally Tool. I actually double-mounted the stamps and phrases, so that I could have a little more flexibility with stamping the images. I absolutely LOVE that stamp set! Gorgeous card!!! !